At the request of readers of this blog I have added this page, which I think is a great idea! I love it when we can come together and be creative. Share your testimony here about how you experience on the Daniel Fast touched your life. There are many ways you can comply. For example the only beverage is water. Eat only vegetables and no animal products. Also, no desserts, etc. Do the best you can and you will still be entering the fast. Hello!! My church is doing the Daniel Fast starting tonight and I would really love to do it but I am a college student living on campus so finding the appropriate foods is going to be rather difficult, do you have any suggestions?? Also I have a couple autoimmune disorders and am not sure if this is something that would be ok to do in regards to my health? Does anyone have any thoughts on this?? This is my first fast and today marks the first day of my fast. In 2014 on Mother’s Day I was diagnosed with a meningioma in the back of my brain. Since that time I have been believing in GOD’s promises to heal me. At the 7 month mark after my diagnosis I had to go back for a recheck MRI. The tumor still showed on the image and I was devastated. In my spirit I felt the LORD speaking to me saying, I don’t care what the picture showed I SAID YOU ARE HEALED!” I have held onto that for 2 years but lately fear and anxiety and doubt have been rearing their ugly heads regarding this. I am too afraid to go back to the Doctor to get rechecked even though I am way over due for a recheck MRI. I have been praying and asking the LORD for guidance and if there was anything more I needed to do to restore me completely to health or anything that was hindering my complete healing. HE showed me that I still had a few people in my life that I needed to forgive and then right after that I saw this post on Facebook about the Daniel Fast. Something moved me and I felt HE wanted me to commit to this fast. I am praying and seeking complete healing from this tumor and any other infirmity that may be in my body at this time. I am also asking HIM to heal my precious daughter’s heart. She is 8 and was born with a heart murmur and another small defect that, although predicted at birth to heal on their own, they still have not. We will see her heart doctor at the end of February so I am believing and praying and hoping that both of us will be completely healed and restored during this time of fasting and laying this before the Lord. Any advice on what I should be praying or how I should be praying or any verses that I should concentrate on during this time would be greatly appreciated. 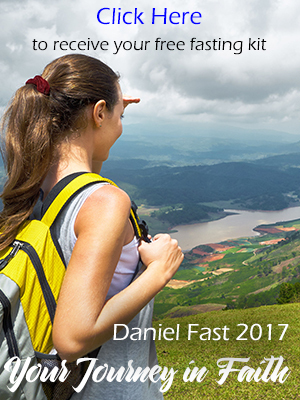 Thank you for your work and the Daniel Fast book ~ I purchased it last week so I could prepare myself for this time of fasting. The menu and guidelines for food have been very helpful. May GOD bless you. You are clearly being called to the Lord and His truth. As you fast, get into His Word. I encourage you to read the Gospels and get to know Jesus as He shows us His love, His compassion, and His truth. God is amazing and always good. He loves you, Elsie. I have been struggling with my relationship with God… So much resentment, feeling like he has forsaken me, feeling as if he has turned his back on me. so much going on in my heart and mind. I cry everyday, feeling Lord what have I done? Just last week, I had a wake up call one morning… I said to myself Elsie, you want God to provide for you, do you ever thank him for all that you currently have? the shelter, the food on my table everyday, a job, loving, beautiful and healthy family? Do you? the answer was NO, I realised I was lost, and I need to re-connect with God again. I prayed this time without resentment and I said Lord, I have never fasted in my Life — NOT EVEN for a DAY, but I am going to sacrifice myself, as you did for me… However I am going to challenge myself for 21 days fasting. I am going to pray, seek him, and re-build our relationship. I am on day 4, I feel so refreshed, every time I think of my problems, instead of crying, I turn to God. I thank him, I praise him, I give him all the Glory and Honour. This is my sacrifice to Him who heals, who listens. “PEACE – BE STILL – I AM GOD”, He said. It is not easy but I am choosing to Hold my Head High and put my Trust in HIM. He is the WAY, the TRUTH & the LIFE. He is an amazing God and he will forever be. Pray with me ladies, Pray for a break through in my FINANCES in the Mighty Name of Jesus. I was wondering if we could use Welches Apples Juice concentrate. I was going to add it to apples for apple sauce. That’s amazing! Thanks for sharing your testimony! I’m on my 4th day and yesterday was amazing! God revealed a lot to me! One of the reasons for fasting was so that God can tell me how I can get out of debt. And boy did he show me! May the Lord send an overflow if blessings your way! You can make some shifts, Louisa. Also, you many drop weight in the coming days as you body continues it’s detoxification. Eat more veggies, fewer fruits, and consider what you are eating. I have been fasting for 12 days now. Though I haven’t lost any weight (not a pound!) physically I do feel lighter and I have enjoyed the foods. I will say the fast has made me talk to God more, think about him more often thne I do already and as I read my bible in the morning things are a lot clearer then they have been. Im very thankful for that. I sure wish I could have lost some weight though. That part is disapointing. On third day of my fast… My flesh is crying out… But feeding my soul with the word. Seeking alignment, healing, and God’s direction for my life and my family, and the ability to conceive and bring forth a child. Thank you so much for sharing your experience with me and with others. Be blessed and glory to God! It’s probably the result of detoxing. Your taste buds are likely to come alive in the coming days. This is my first fast. I have never done anything like it, although I have wanted and tried I have never been consistent. So this fast is for me to become more consistent in drawing close to God, and dying to flesh. I am a 20 year old nursing student so this will not be easy for me, but I am doing it to Honor Christ and draw close to Him.